The CEO - Lost in space and time? Being a CEO today is a very different experience than it was even a decade ago – in the past a new CEO would know the space where their company operated and be given time to effect change. This has been transformed – space has expanded, while time has contracted dramatically. How can CEOs understand this new landscape and successfully plot courses through it? The average tenure of CEOs has been falling steadily, down from nine years in 2000 to five years in 2017. Simultaneously, there has been a revolution in the nature of business itself: today only two of the world’s top 10 global companies by market capitalization are the same as 10 years ago, while the business space leading companies occupy has radically changed. Being a CEO today is a very different experience to a decade ago. In the past the new CEO would have known pretty clearly the space that his or her business occupied, and would be given at least a few years’ time to effect change, but for today’s CEO, space has expanded while time has contracted. 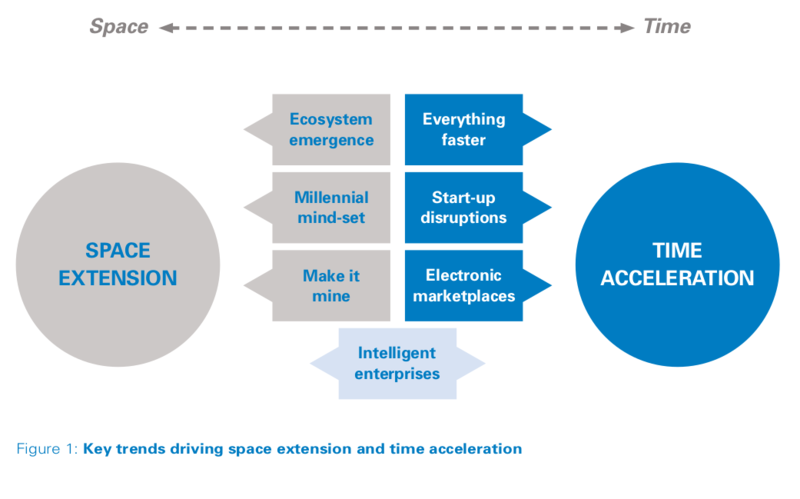 In this new “extended space, accelerated time” universe, the CEO’s role has become a lot more challenging – how can they navigate the right path for their organization and avoid getting “lost”? In this article we explore the changes and propose a new framework to help CEOs map the right course. The challenges of leading a large organization in an uncertain environment have always existed in the business world. However, it was not until the 1990s that this began to attract attention in terms of leadership tools and approaches. The acronym VUCA was borrowed from the US military to characterize the issues: volatility, uncertainty, complexity and ambiguity. Since then CEOs have been urged to develop better resilience in their organizations to cope with VUCA. For example, building in float or slack to cope with volatility, developing better intelligence to mitigate uncertainty, restructuring or bringing in special resources to address complexity, and using more experimentation to reduce ambiguity 1 . There would be a clear business vision and strategy, often with a five- to 10-year time frame, with an accompanying strategic plan cascading in a logical way down through the company to set multi-year priorities at business unit and operational levels. There would be continuity of a company’s core business, even if a degree of diversification was part of the strategy. Success would be achieved through aligning processes, resources and organization with the strategy, and driving productivity and efficiency in a disciplined and systematic way. In the first year, conduct a strategic review to develop the vision and strategy – and deliver enough visible, quick wins to pass the “first 100 days” test. In the next two to three years, implement the strategy, including top-line growth, productivity and efficiency initiatives, improving business alignment and, where necessary, taking measures to adapt culture. In the following years, hopefully reap the benefits in terms of performance and shareholder value. (space); and second, there is a huge acceleration in the required pace of the business (time). First of all, as standard products are being replaced by “experience and services” and new technologies are becoming increasingly ubiquitous and pervasive, industries are converging and traditional business boundaries are blurring. This has led to a new ecosystem emergence in which previously unheard-of parties are jointly experimenting and collaborating to innovate and match customer and consumer appetites and imaginations – not just companies, but also customers, communities and crowds. Secondly, there is a sea change in consumer mind-sets driven by the millennial generation. The millennial mind-set places a high value on the authenticity of a company’s long-term purpose, while simultaneously demanding responsiveness and adaptability to change. Millennials are increasingly comfortable without permanent employment and do not feel the same need to own the assets they make use of – whether houses, cars, bicycles or technology. This has major implications for the business scope of companies that make assets. Millennials also increasingly want to “make it mine” – to stand out, make a statement, have an opinion, and trust in themselves to “do it their way”. Full personalization of products and services is now enabled by digital technologies. Innovative companies such as Nike are reinventing themselves to provide new experiences and associated services, not just standard products in an established business space. There are many drivers accelerating the pace of business. First of all, there is an underlying trend of everything faster in all aspects of life, both in the context of our personal lives and in business, driven by technology, globalization, social norms and economics. For business this implies expectations of more rapid decisions, faster and continuous innovation, ever more rapid time to market, and shorter ownership and/or alternatives to ownership. Second, we are seeing start-up disruption in a way never seen before – the examples of Uber, Airbnb, Amazon and Netflix need no explanation in terms of their effects on the global taxi, hotel, bookstore and premium content markets. What is new is how technology allows start-ups to gain scale and achieve global reach within weeks or months instead of, for example, the decades it took McDonald’s to disrupt the restaurant business in the 1950s. Third, the advent of electronic marketplaces and platforms has substantially accelerated the dynamics of business for consumers and producers alike. This has impacted how we buy and source, how we create and consume, and ultimately how we engage and choose, leveraging global and technology-based interactions between parties and peers. And finally, the digitalization of our society and economy is generating a more-than-exponential increase in the volume of data, profoundly affecting both the scope and the dynamics of business. Increasingly, intelligent enterprises make use of new technologies that collect and process that data, and thereby identify and exploit, in an instant, new and/or unexpected relationships across data sets. Artificial intelligence (AI), robotic process automation (RPA), blockchain, and advanced (predictive) analytics are well-known examples. 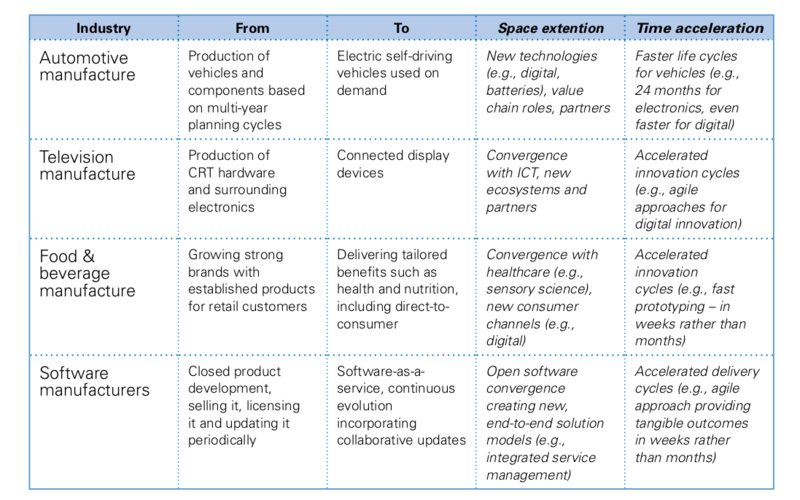 Effective and rapid deployment of these technologies, usually requiring new or specialist competences outside the core business, can provide rapid and sometimes disruptive competitive advantage.